October 8th is the anniversary of the Chicago Fire of 1871. 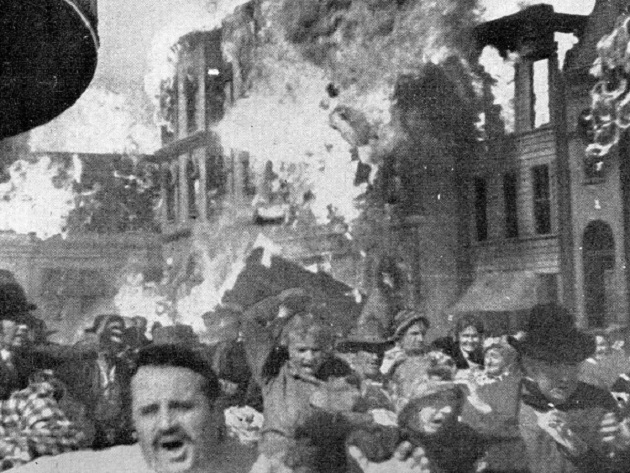 Today our topic is the 1937 feature film about our great conflagration—In Old Chicago. The movie is a blockbuster. Twentieth Century Fox spent $1.8 million making In Old Chicago, a hefty price tag for the 1930s. Much of the budget went into the climactic fire scenes. Of course, the whole thing was filmed on a Hollywood sound stage or with miniatures, so the effects look primitive to modern eyes. The studio did do its historical research. Many of the sets are based on old pictures from the actual fire. However, the screenplay itself is almost all fiction. About the only true facts are that a fire starts in the O’Leary barn, and Chicago burns down. 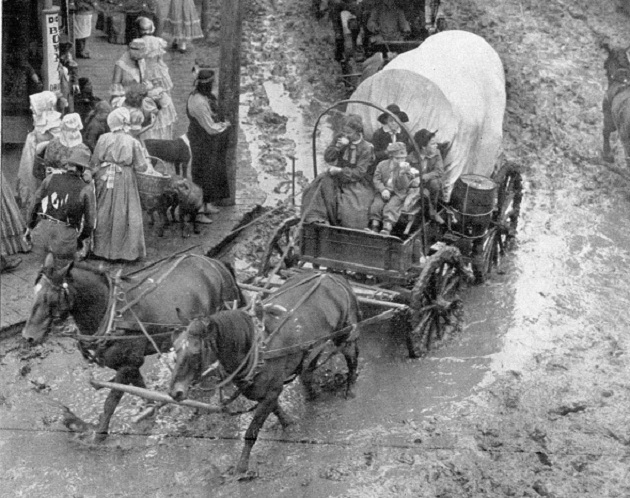 The movie opens in the 1850s, with the Irish O’Leary family on their way to the up-and-coming city of Chicago. Dad O’Leary is killed in an accident, so his widow Molly (Alice Brady) has to raise her three sons alone. She starts a laundry. The city grows. The O’Leary boys grow. Handsome, charming Dion (Tyrone Power) becomes a gambler. Boring-but-honest Jack (Don Ameche) sets himself up as a lawyer. The third brother hangs around the other two. Alice Faye plays the female lead, a saloon singer who is courted by Dion. Brian Donlevy is the villain, Andy Devine provides comic relief, and Rondo Hatton lurks about looking sinister. At length, Jack is elected Mayor of Chicago. He’s a reformer and has vowed to clean up the city’s gambling dens. This brings him into conflict with brother Dion. But before they can have a showdown, the cow kicks over a lantern in the family barn and things start burning. The movie climaxes with 20 minutes of the Great Fire. All the tangled plot points are settled. And incidentally, Chicago is destroyed. 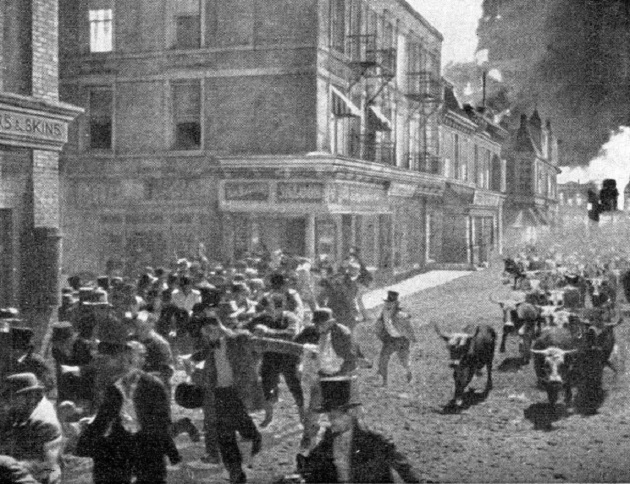 In 1937 Hollywood was going through a disaster-movie phase. San Francisco had been a major hit for M-G-M. So when 20th Century Fox decided to make their own disaster epic, they kept most of the plot from the M-G-M story, and simply replaced the earthquake with a fire. Some of the parallels are unintentionally hilarous. In the earthquake scenes of San Francisco, Clark Gable wanders around with a blood stain down his right cheek. In the climax of our film, Tyrone Power wanders around with a similar blood stain--but on his left cheek. And the shameless copying succeeded! 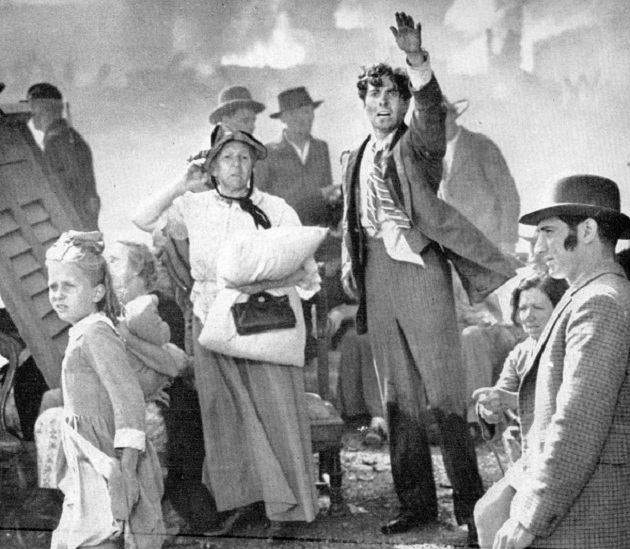 In Old Chicago was praised by the critics and became one of the top-grossing films of 1937. It won two Oscars, including a Best Supporting Actress award for Alice Brady. As I’ve said, the movie is full of historical inaccuracy. I’ll mention only one–the real-life Mrs. O’Leary was named Catherine, not Molly. But if you don’t mind watching old black-and-white films, In Old Chicago is 95 minutes of good, hokey entertainment.